You can read our report on Wales' last-gasp victory over Trinidad & Tobago here. And hear how a youthful looking Germany got on against Serbia over here. Scotland kick-off the Euro 2020 qualifying action at 15:00 GMT against Kazakhstan tomorrow, while Northern Ireland host Estonia later on Thursday (19:45 GMT). England welcome the Czech Republic on Friday (19:45 GMT) and the Republic of Ireland are away to Gibraltar on Saturday (17:00 GMT). Then, it's Wales turn on Sunday as Slovakia come to town (14:00 GMT). John Tudor: Well done Woodburn, a scrappy goal, but a goal - a nice win. 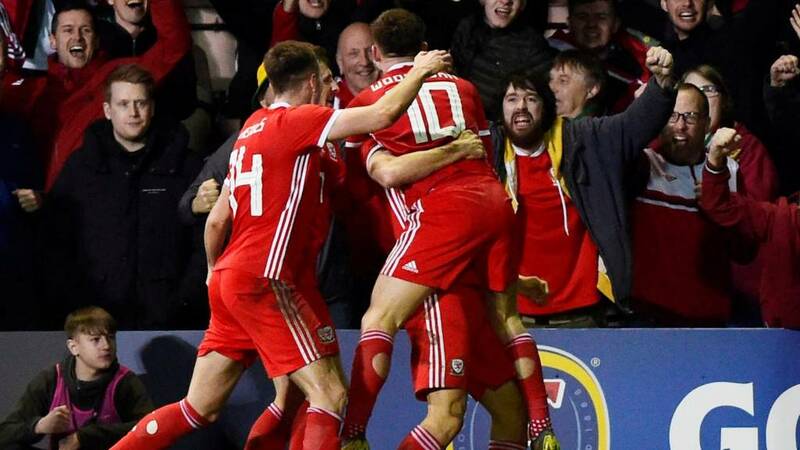 So, it's a case of job done for Wales ahead of their Euro 2020 qualifying opener against Slovakia on Sunday. A resilient Trinidad & Tobago threatened to keep a sell-out crowd quiet at the Racecourse Ground, but Wales were superior in the second-half and in the end were good value for their goal. Ryan Giggs will undoubtedly field a much-changed side at the Cardiff City Stadium at the weekend, in a game that will set the tone for the rest of their qualifying campaign. Germany rescue a draw against Serbia. Joachim Low's new-look side were booed as they exited the pitch 1-0 down at half-time, but Leon Goretzka rescued it for his side. Ben Woodburn's stoppage-time goal wins it for Wales in Wrexham. We do have a late winner! Ben Woodburn, who has been excellent in this second half for Wales, gets a deserved goal for his efforts, chesting in Will Vaulks' lofted cross to the back-post. A small break in play as James Lawrence recovers from taking a blow to the head. We'll have four minutes of added time! Late drama anyone? Ben Woodburn has another half-chance for Wales, again with his head, but as has been the case on a couple of occasions this evening he can't quite direct the cross goal-bound. Trinidad look more than happy to leave Wales with a solid clean-sheet and a disciplined display. Wales would love a last minute winner here though, if only to thank their great support. No goals so far as we enter the final five minutes, but there have been some promising periods of play by Ryan Giggs' experimental side tonight. Be sure to have your say on how the players have performed using the Player Rater. If this was not a friendly that would be a red card for Lee Evans. That's a nasty looking collision as midfielder Lee Evans arrives very late, with his studs raised. This Trinidad team is starting to look a bit tired, the changes have livened it up a bit but Wales have still struggled to create clear-cut chances. There are no poor national teams anymore. Trinidad are organised and honest - they work ever so hard and double up in wide areas so they are making things difficult - you can't play at 50%. Wales' George Thomas and Trinidad's Kevan George clash in the air, with both suffering awkward-looking falls. Both are back on their feet after a short breather as we approach the final 10 minutes at the Racecourse Ground. It's all Wales at the minute. Ryan Giggs sends on Schalke 18-year-old Rabbi Matondo for the final 20 minutes. There's plenty of excitement around the former Man City winger's potential. Can he have an impact tonight? It was a lovely dink and a lovely header by George Thomas but he was offside. Serbia give away possession deep in their own half and the home side take full advantage! It's substitute Leon Goretzka who has eventually found the equaliser for Germany, smashing the ball in from the edge of the penalty area much to the relief of the Wolfsburg crowd.